Its my stop on the Spring Tour for Style Maker Fabrics, and this year, nothing is more quintessentially Spring for me than wide legs and a classic combo of white and denim. Check out what I created with some Style Maker favorites for Spring in Virginia! While I love the beautiful colors Spring awakens in our closets, lately I’ve really been gravitating towards denim blue and white, which is the palette I chose to work with for my outfit. Its also a combo that is decidedly Americana, and what better to evoke Americana Spring and days spent outside among soft green grass and breezy blue skies, than a pair of overalls. The Burnside Bibs by Sew House Seven has been on my to-make list for quite some time, but like most patterns I put off, I went back and forth on whether or not it was a style I’d like on myself. 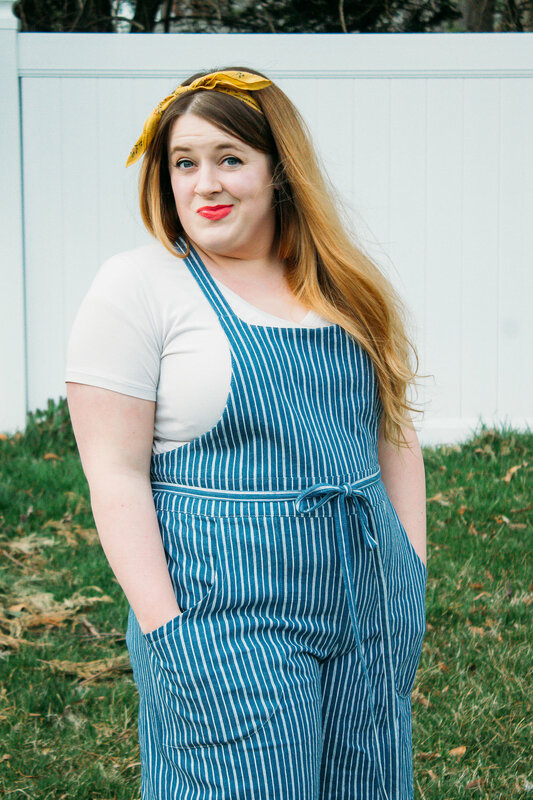 However when looking at different overall + bib options I liked the the Burnsides were a softer, simpler interpretation of overalls which would definitely suit my style. So they finally made it to the top of my list! 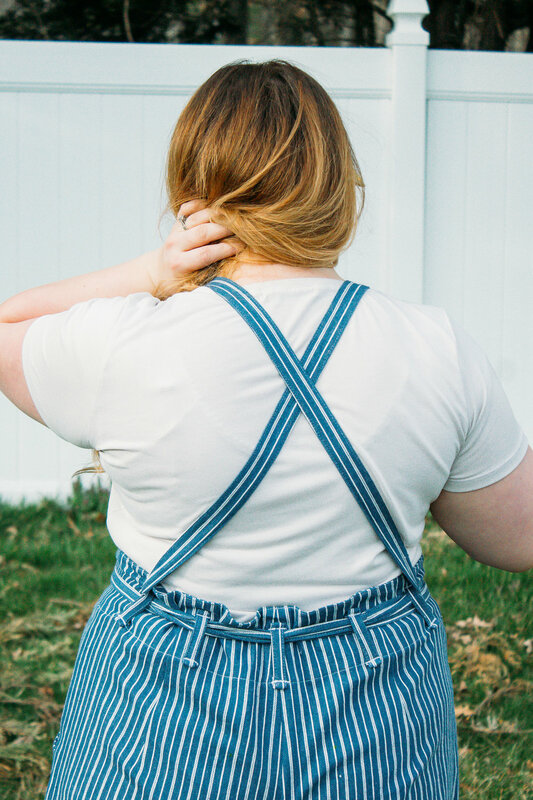 I had also been loving Sara’s stripe denim Kendrick Overalls since she made them a few months ago, and they served as the perfect inspiration for a pair of stripe denim overalls of my own. Since the stripe denim I used has stretch incorporated in it, I chose to size down on my bibs. I made version #1 which would normally have a side zipper and a slimmer fit, but because my fabric had enough stretch I was able to make them without the zipper just fine. The only adjustment I made to the pattern (as usual), was to shorten the length of the pant leg and rise, though next time I think I’d like a little more length in the leg. I am so satisfied with how these bibs turned out! The stretch denim makes them super comfortable (a must when juggling kids), and though the extra long ties are a bit of a bear to turn, I love the many options for tying my overalls. The front patch pockets are nice and roomy which makes up for ditching the back patch pockets in favor of a less utilitarian look. I can’t wait to wear these to park days with the kids, BBQs, and all of the other fun activities warmer Spring weather brings. Though in a bit of a supporting role to the bibs, I also made a Union St. Tee by Hey June Handmade to complement the Burnsides. I haven’t made the Union St Tee since last year when I made these ones that didn’t quite go the way I hoped. But I decided to give it another try now that I’m not pregnant and see how I like it. And holy cow, am I so much happier with this version! The fit is so slimming which is something I wanted, and the v-neck is just right—not too low or too high for my preference. The sleeves are a little snug, I suspect because the fabric isn’t super stretchy like a bamboo rayon (my usual t-shirt go-to), so I might add a full bicep adjustment to the next one and see how that goes. But otherwise, a total winner! I made my v-neck Union out of a cupro modal jersey that I am just gaga for. Its thin but opaque enough to wear without extra layers underneath, and the suede feel is so nice. I actually have a shirt from Anthropologie out of a similar fabric and I was so excited to find a copy cat textile on the Style Maker website (in several colors to boot!). This is the pearl color way and its my perfect light neutral option. As much as I love the look of a classic white tee, true white ends up being a little too overpowering on me so I never end up wearing white shirts. This pearl color is a more of a bone or light grey-ish ivory, but it functions beautifully as a white option without being too strong. I love it! Its a good thing I paired it with bibs because it already has a couple marks from the kids, I’ve been wearing it so much lately. It looks like I might have to order more to make a backup! These two pieces are guaranteed to get a ton of use over the next few months and are definitely patterns I would make again. It was such a pleasure to be part of this year’s Spring Style Tour and try out some new fabrics and patterns—make sure to check out Sharadha’s blog, Sweet Shard, tomorrow for her Spring Style Tour make! This post is my honest opinion using fabric I received free of charge from Style Maker Fabrics.